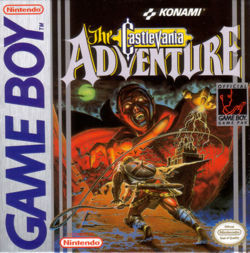 Today I’m reluctantly looking back at Castlevania: The Adventure for the original gameboy. I do not have many good things to say about this game. This was the series’ first entry into the portable market in the fall of 1989. It is also notable because it is the first game in the series to not star Simon Belmont as the protagonist. Instead, for this adventure we get Christopher Belmont, whip ready in hand to do what the Belmonts do best. The first thing you’re going to notice playing this game is that Christopher moves so sluggish that it’s not even funny. You will scratch your head wondering why this did not happen in other nes to gameboy transitions. When Mario jumped into the world of portable gaming he never got this treatment, he still moved at a good clip. The speed problem was eventually corrected though, it only took till the year 2000 in Konami’s GB Collection Vol 1 released in Europe. Christopher is colorized and moving at the speed he originally should have been moving. After you get over the speed of the game and really start getting into it, all you will find is more problems unfortunately. The level designs leave a lot to be desired. The main problem with the levels is that there is no variety. You will see the same type of levels throughout the entire game, which isn’t very long. Your adventure sees you through 4 levels each with their own boss, the last boss of course being the man of the hour, Dracula himself. Sub Weapons have gone on the wayside in this game, instead the game lets you shoot a fireball out of your whip if you get 2 whip upgrades. However, if you get hit then your whip gets degraded and you no longer have the fireball until you get the whip upgrade again. Something else added to this version was a timer that told you how much longer you had in each level. Most of the time you beat each level with more than enough time, so it’s never something you should worry about. Something different that works out pretty well in all of the original gameboy Castlevania’s is the use of ropes. 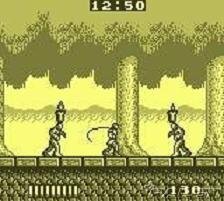 Instead of stairs as you were previously used to in all the other Castlevania games, the gameboy decided to throw all that out and make you climb ropes. The feel of the game is changed by this little thing, because you will have to switch ropes and watch out for enemies while climbing the ropes to reach your destination. It reminds me a bit of Super Mario Bros 2’s vines. If you are good at this game, you can beat it in about an hour. I do not regret playing it, but it will be an incredible long time before I play this again. Controls: 1/10 – this game’s controls make Haunted Castle’s look like a godsend. Level Design: 2/10 – Did I mention that the level design is repetitive? Overall Enjoyment: 1.5/10 – Sad to say, but this is not Castlevania’s brightest star. Every series that goes on as long as the Castlevania series has gone on for hits a few snags here and there. It is a game that might have been rushed to market given that it came out late fall, trying to meet the Christmas season buying rush. I hope that isn’t true, but you never know. I will say that the next entry in the retrospective is a game that is held in higher regard. It is arguably the greatest achievement the series achieved on the NES, Castlevania 3: Dracula’s Curse. This entry was posted on July 1, 2008 at 7:29 pm and is filed under video games with tags Belmont, Castlevania, game, gameboy, memories, nes, nintendo, nostalgia, old game, retro, retro gaming, retrospective, video game, video games. You can follow any responses to this entry through the RSS 2.0 feed. You can leave a response, or trackback from your own site.